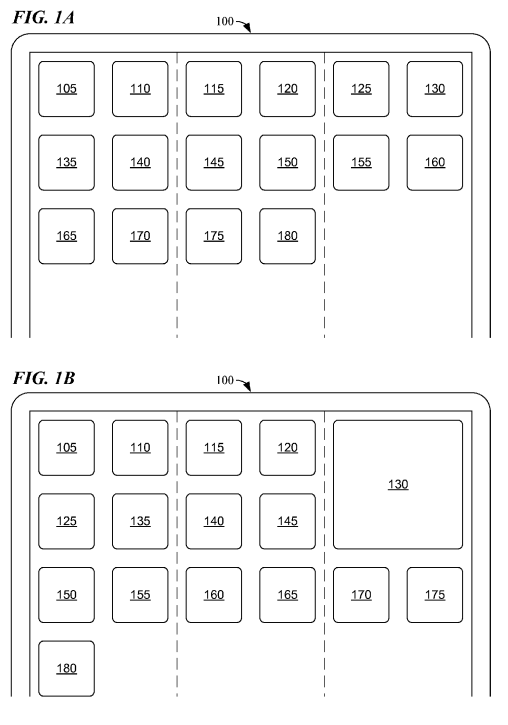 Facebook’s U.S. Patent Application No. 13/715,636 claims a method for displaying a set of images after reshuffling or resizing the images. The Examiner rejected Claim 1 (below) as anticipated; and that rejection was affirmed by the Patent Trial and Appeal Board. Now on appeal, the Federal Circuit has reversed and remanded — finding that the USPTO had too loosely interpreted the prior art. The claimed image rendering process begins with a sequence of images. Each image is assigned a “first position” within an “array of contiguous image elements” — in other words, the images are put in a particular order. When a user adjusts the position or size of an image — there may be a need for reshuffling of the images into “second positions.” The claimed method includes a requirement that the reshuffled sequence “be contiguous.” — i.e., no gaps in the array. Notice the reshuffle above that occurred from 1A to 1B when a user resized image 130. Nothing about Perrodin’s algorithm required contiguity. It is true that the example depicted in Figures 18 and 19 happened to result in contiguity. But that cannot represent a general rule that would demand contiguity for all images, as required by the claims here. . . . Perrodin’s algorithm could not guarantee contiguity. So, we have a situation here where the prior art teaches contiguity-after-reshuffle, but is also open to situations where a reshuffle might result in non-contiguity. The claims – on the other hand – include “a rule requiring [contiguity].” Since the prior art does not include the rule requiring contiguity, it cannot anticipate. by the computing device, providing information to render the array of contiguous image elements. And the bait has bait has been taken! The disclosure: “….A ball, wherein said ball is red or green…..
1. A ball, wherein the ball is green and owned by an ign0 ramus patent attorney. Anticipated by a ball of any color(s). A ball bounces the same whether red, green, candy-striped, or whatever. Please pardon potential (re)peat due to the dialogue count filter. You presume that “bounce” controls. What if some other factor is at play? For example, I am instantly reminded of MaxDrei’s old hypothetical concerning a blue racquetball, with blue providing a functional improvement due to that particular physical property of wavelength and interaction with the larger system of the game of racquetball. Your statement then attempts to prove too much. By this, the more strict is in that every limitation – in the context of the limitation and the claim – must be met. By this, the less “responsive” is in that if the more strict is met, then there is no need to respond to whether or not a particular field of art is in play. It does not work the other way around. One cannot get “there” first through the less “responsive” reasoning and then attempt to be more strict. The path is not bilateral (strictly speaking – but I am willing to be less “responsive” if one can show that the scrutiny per the more strict element is fully met ). Maybe try addressing what I wrote in post 8. Good luck. Already did in post 8.2. You wishing me luck is not only you being your typical insincere self, but your typical c1ueless self. No you posted some vapid banality without addressing any of the particulars of the fact pattern I presented, where the particulars are the entire point. Good grief put on the big boy pants for five minutes. LOL – your “big boy” comment, along with the accusation of vapid banality is nothing more than your usual Accuse Others meme. My reply was directly on point and cut through the obfuscation that you wanted to trap with (as if anyone could not see the joy when you THOUGHT that your bre’er rabbit tactic had worked). The point being that your first “trap” did nothing but show just how little you understand patent law. The Fed. Cir. might be better served if its clerks flagged precedents earlier than those of last week. Such as, cases before they were born. Such as, 1983’s Kalman v. Kimberly-Clark, which explains that the law of anticipation is not about what a reference “teaches.” It’s only necessary that the claims under review “read on” something in the reference. But did it “read on” that figure? I don’t think so. But we’ll never know for sure, because the panel did not consider or discuss another “rule” — the one articulated by Judge Rich in Kalman. Legal analysis the same – different input with different claim may yield different result. You really want to hold onto that first example as your display of understanding what novelty means? As David agrees with 6 (to an extent), I will – shockingly – agree with Malcolm (to an extent). Notwithstanding the comments below vis a vis “screwdriver” and “walking,” when I take a step back and look at the Thread Title (“Teaching a Result vs Guaranteeing a Result” I am struck that the question (perhaps inadvertently loaded) is focused on a Result. Whether teaching OR guaranteeing then – without more – is not sufficient to move “Result” to a method of obtaining that result. If anything that this case illustrates is the hubris of the PTO. Had this been affirmed there would no 102. 102 would have been turned into 103. Disturbing that 6 talks about just generating a 101. That is about the state of prosecution before the PTO. Examiners know they can just pull a 101 out of their a$$ for any claim. Examiners know they can just pull a 103 out of their a$$ for any claim. Turning 102 into 103 (and 103 into a mere piecemeal 102) is a desire of those seeking a weak patent system. Finding any way to “just say no,” no matter how conflated this makes things, is the desire. Of course the problem is that the fall back now is the CAFC which is full of anti-patent judicial activists selected by Google. Go read how software programs (information processing) projects are bid out. The specification for what is wanted is written in functional language. Guess what else. Text books use functional language and say expressly that there are too many solutions to problems not to use functional language. Guess what else. All areas of claims use functional language even those claims to arrangements of atoms. Night Writer, I’m going to admit that I kind of agree with 6. A little. With regrets. The claim under appeal is a packing algorithm that packs elements into columns without gaps. What could you use that for? Content in a three-column news feeds. Or: blocks of data stored in three linear-array storage devices or memory. Or: physical items on a three-lane assembly line. If you’ve got elements of a size and you’re organizing them into columns, you could use this algorithm to avoid gaps. That sounds a little uncomfortably like a general-purpose BCD-to-decimal conversion algorithm. There’s a clear and appropriate solution here. The specification isn’t about general-purpose item-packing: it’s about image rearrangement in a columnar presentation, and how to avoid gaps when variable-sized images are moved or resized. As I described below, the technical problem is appreciable: economizing display space is an undeniable objective in UI design, particularly for mobile devices. The claims could handily sail over the 101 hurdle if they were characterized for their intended use – the one to which the specification is actually directed. Sure, it can have some breadth: they don’t *have* to be images, could be videos or blurbs of text, etc. But it can’t be expanded to packing *any* kind of elements in *any* kind of columnar arrangement. Intended use does not get you over the 101 hurdle. Diehr was not a recitation of the Arrhenius equation “for the intended use of curing rubber.” It described a specific solution to a specific problem, where the solution, in part, made use of the Arrhenius equation. The same principle applies here. Tacking on an intended-use statement – sorting images into columns “for presenting on a display” – would not satisfy 101. But describing a method of presenting images on a display, where the final step is actually displaying the images in this gapless columnar arrangement, is a particular solution to a particular problem. Diehr would not be patent eligible today. Come, now. Diehr is the Supreme Court’s high-water mark for patent-eligiblity under § 101. It is constantly referenced as the quintessential positive example – Alice itself references it six times. I’ve argued in the past that Diehr is inconsistent with the framework that has been established around Alice. But this conflict reflects the internal inconsistency and the breaking-point of Alice, not any change in the patent-eligibility of Diehr. And I believe that the reason for all of the judicial consternation about the state of § 101 is due to the realization that Diehr cannot prevail. It’s like a new theory of physics that is trendy and popular and convenient, but somebody discovers that it is inconsistent with the laws of thermodynamics. The presumption is never that somebody has found a way to cheat thermodynamics. Does not matter one whit any such lip service given to Diehr in the horrible recent cases of Mayo and Alice (Mayo flat out contradicts Diehr, even as it says it does not, and calls it the case most on point). I did NOT say that Diehr should be NOT eligible today. Anon take your pants off of your head. 101 jurisprudence is completely unnecessary. Breath is policed by enablement and prior art. As well as other ways that are not part of 101. 101 at the USPTO right now is worse than a witch hunt. Shoulda just checked for a 101 and if not unless you have the rule don’t even waste the time. Apparently we’re the leading expert agency in advancing the art of rule making. * Start with three columns. * Iterate over the array, pulling out “large” elements, and tacking each one onto the shortest column. Also, aggregate “small” elements into a group, and when the group is of a certain size, tack it onto the shortest column after a large element. * After tacking on all the large elements, incrementally add the remaining small elements to the shortest columns. Now, I’ll state that this is not how I would draft this claim. My preferred claim would be closer to the qualitative description I provided above. I don’t submit claims anywhere near the level of pseudocode, but I at least like to describe the mechanics of the pseudocode as the actual solution to the problem. I would be a little concerned about preemption. However, this case isn’t about claim-drafting style or § 101; it’s solely about anticipation – based on Perrodin (20130238964), which is a similar collage presentation technique that also permits image reordering and resizing – but with a simpler resorting algorithm that leaves gaps. See Figs. 13, 16, and 17. The Perrodin specification also explicitly acknowledges that the resorting may leave gaps – and neither characterizes gaps as a problem nor proposes any way to fix it. Now, it’s entirely possible to characterize the application in question as an improvement of the limited technique of Perrodin. Moreover, that improvement could have been described as having an important technical effect: given the display sizes of mobile devices, developers strive for content layout that makes great use of very limited space, and this improvement economizes space. Unfortunately, the applicant presented no argument about the significance of the feature, which may be why the Board punted. A specific claim element was added to address a deficiency of the prior art – one that the prior art both acknowledges to exist and shows in its own figures. That claim limitation is supported by at least one detailed algorithm. The prior art algorithm does nothing to avoid gaps – nor even acknowledges it as a problem. The prior art cannot be interpreted as covering that feature merely because the problem, coincidentally, does not arise in some circumstances. The Federal Circuit is correct. The decision of the examiner – and, more alarmingly, the Board – to disregard the explicit claim elements calling out the point of novelty should be uniformly criticized. Regrettably, this behavior is tolerated all too often in examination – which is why the PTAB remains inundated with an unmanageable appeal volume. The point here, apparently, is a task-specific variation of a packing technique: fit the largest items together first, then tack the smallest items onto the end. The improvement is grouping together small elements into subsets that fill in the nooks and crannies around the large elements. Is it the most novel technique in the world? Maybe not, but this isn’t a question of universal novelty – the question is about what Perrodin teaches. And it’s indisputable that Perrodin doesn’t teach any gap-filling improvement of packing algorithms for this particular column-generation task. Of course, the usual suspects have already performed their “Sniff” tests and have gone apoplectic over the fact that this appears to be a computing innovation. I only have so much time in the day. Ain’t got time for that. The solution to the alleged computational (ie logic) “problem” does not appear in the claim at issue. This is why the opinion is a jo ke. Question for the peanut gallery – Are you allowed to formulate a claim that distinguishes from the prior art solely by a functional term? i.e. Can you say “The problem with the prior art bicycles is that their tires are not puncture proof, but I solve that problem, I claim a bicycle with puncture proof tires”? In other words, did Facebook’s attorney’s malpractice here? Did they just admit that their claim is invalid because the distinction between the prior art and this is a functional term. did Facebook’s attorney’s malpractice here? Pretty sure there is no such thing as “malpractice” when you’re hunting for nugs at the bottom of the cessp 00l. This is Farcebook we’re talking about, after all. Not just one of the worst companies that ever existed, period, but one of the most egregious abusers (and manipulators) of the broken patent system. Just pick a random patent application from the portfolio and grab your pyook bucket. Are you allowed to formulate a claim that distinguishes from the prior art solely by a functional term? (1) This is a question for 112: written description, enablement, preemption, etc. Could also raise issues of ambiguity, much the same as in Biosig. This is not an issue for 102/103 – which simply focus on: If we can settle on a reasonable interpretation of the claim limitation, does the prior art teach it? The answer here, indisputably, is no. 9,937,421 (“Haptic chair for motion simulation “): A device for providing the illusion of motion, wherein the device comprises at least two movable parts for stimulating vestibular sense and kinaesthetic sense independently, each of the at least two movable parts being displaceable according to at least two degrees of freedom, each of the at least two movable parts being displaceable independently relative to each other, wherein the at least two movable parts include a moving headrest for stimulating the vestibular sense and at least one moving armrest for stimulating the kinaesthetic sense. 9,952,026 (“In-flight insulation generation using matrix-based heat sink for missiles and other flight vehicles”): An apparatus comprising: a heat sink configured to absorb heat, the heat sink comprising a matrix that includes a porous structure having multiple pores at least partially filled with one or more phase change materials; wherein the heat sink is configured to convert the matrix into an insulator that comprises an aerogel as the one or more phase change materials change state and exit the porous structure due to the absorbed heat. 9,957,059 (“Fuel tank, fuel pipe, and aircraft”): A fuel supply apparatus comprising: a fuel tank that stores liquid fuel therein, wherein at least a portion of an inner wall of the fuel tank in contact with the liquid fuel is a hydrophilic surface configured to solidify water thereon; a drain port that is fluidly coupled to the fuel tank and configured to discharge the water from the fuel tank; and a fuel pipe attached to the fuel tank, the fuel pipe directing the liquid fuel in the fuel tank to a fuel supply destination, wherein at least a portion of an inner wall of the fuel pipe is made of a material having water repellency, or is subjected to surface finishing for imparting water repellency. Critics like the EFF routinely take the position that functional language is wrong and bad and outrageous in the context of a software invention… yet who have no qualms whatsoever about functional language in the context of any other technical field. I believe that the line between functional language that claims a function and functional language that claims a result depends on specificity and the knowledge of PHOSITA in the relevant field. That is: Given this claim limitation, could PHOSITA readily identify and implement at least one way of implementing it? It’s a pretty simple test. “A doorknob that only rotates in a clockwise direction and resists rotation in a counterclockwise direction” is a function. “A doorknob that only turns for authorized individuals” is a result. What’s the difference? An average mechanical engineer could instantly describe what the first one means, and at least one basic, structural implementation. (But the specification should recite one, of course, and preferably several if that’s the point of novelty.) The latter is wish fulfillment. Of course, this principle requires a factual determination that is uncomfortably subjective – which is why, as I stated above, I don’t draft claims like this. Unfortunately, in the field of software, examiners and judges play games with the level of PHOSITA. Sometimes they assert that software engineers are extremely talented and productive (such as Alice: “an undergraduate student could implement this invention in a weekend,” or some such thing). Other times they assert that software engineers are totally clueless and need to be walked through the details of the simplest algorithm, else it’s overbroad and preemptive. The gross inconsistency reflects gamesmanship in pursuit of an objective. Wowee zowee! David Stein just discovered that the PTO grants cr @p claims. It must prove … something! I don’t routinely take that position. I don’t know anybody who does. LOL So. Freaking. What. Meet David Stein, folks. He is allegedly an attorney. He should know better. In fact, we believe that he does know better but that’s a whole other discussion. ROTFLMAO. Yes, please address the substance of the question, Steiny Whiny. Unfortunately, in the field of software, examiners and judges play games with the level of PHOSITA. What about the applicants who file the cr @p in the first place? I mean, really. tldr: MM just got owned, and so responds with “LOL”s and personal insults. Does he respond with anything else? You mean really, MM? I think you mean to say that you are an anti-patent judicial activist with no ethics. No, the the gross inconsistency arises from the fact that if you don’t construe what the invention is as a matter of law (akin to claim construction) than you can’t know which PHOSITA is pertinent. Is this invention really an improvement to stock trading and a trivial computing change, or is this an expert-level computing change that happens to improve stock trading, among other activity? Is your PHOSITA found on Wall Street or Carnegie-Mellon? Given that a ten year old can dream up “new” “functionality” for a pre-existing computing device, when functionality appears in an “apply logic to data” claim, the “expertise” is almost *never* in computation and almost always in something else. Often that “something else” is “scrivening” because even the functionality is older than the hills. Like “using space more efficiently”, for example. Or something physical like protons, neutrons and electrons. Is there where David Stein’s past numerous examples of functional language outside of the computing arts (and typically met with stony silence from the same usual suspects) would come in handy? Or maybe a refresher reminder to Random on a certain Professor’s coined term of Vast Middle Ground? An application is submitted with a claim reciting A+B+C, where B explicitly describes the point of novelty. The examiner rejects the claim under 102 citing reference X. The rejection is traversed by noting that X does not teach B, but rather teaches Q, which is materially different than B for specific technical reasons. The examiner then rejects the claim under 103 citing the combination of references X+Y. The examiner responds that “references in a 103 rejection cannot be attacked individually, see KSR.” Full Stop. Many examiners seem to believe that KSR is a snake-oil salve to deficiencies in a 102 rejection. They refuse to be specific as to which reference teaches the point of novelty – only vaguely arguing that “the combination” teaches it. That’s not how obviousness works. When is a logic step Recited as “rule”+result deemed “materially different” from another logic step stated similarly? May be a new drafting tip that can be applied in various circumstances to avoid prior art. Then when the prior art shows structure merely “having” the same result or physical property you point to examples in the spec of that art where it does not always have that, and therefore argue it fails your “requirement” aspect. 1. A golf ball comprising: an inner core comprising a polybutadiene material; an outer core comprising polybutadiene material and a graphene material in an amount ranging from 0.1 to 5.0 weight percent of the outer core, wherein the outer core is required to have a flexural modulus ranging from 80 MPa to 95 MPa; and a cover layer disposed over the outer core; wherein a dual core comprising the inner core and the outer core has a compression value ranging from 40 to 55. ….A ball, wherein said ball is red or green…..
1. A ball, wherein the ball is required to have a green color. Then again, we are dealing with patent attorneys so all bets are off. Regardless, the caveat to the caveat is that the alleged patentability of this method claim (like most methods involving computers) is entirely dependent on the patentability of the “computing device” that carries out the logic instructions. “….A ball, wherein said ball is red or green…..
Actually, no -it does not anticipate. You need to look at what it means to anticipate – but you were too busy scoffing to bother with the lesson here on the actual law regardless of whether or not this claim at point was a computing claim or not. Once again, you went apoplectic for the wrong reason, and missed the underlying issue of law that was at point. The issue here is clearly not whether something “could” be something but instead whether something “must be” something. “Could” is not a part of anticipation. “Is” (or “must be”) IS a part of anticipation. Your immediate example though is a bore, given that it is tedious and beyond question that even printed material could easily be found that requires the ball to be green (think manufacturing order). But hey, your (strawman) hypo and all. Honest question – why would a reference that teaches “the ball may be red or green” not anticipate a claim limitation that “the ball is green”? In my view, the reference is teaching two embodiments, one where the ball is red, and another separate embodiment where the ball is green. That is, the prior art’s statement “the ball may be red or green” is teaching positively that the ball is red, and that the ball is green, albeit in separate scenarios. Because the alternative that you seem to be supporting is that the prior art teaching that “the ball is red or green” teaches neither that the ball is red or that the ball is green. The legal point under consideration is novelty. My aopologies, as I have used “is” in two different connotations. In the post above your question, focus on the “must be” aspect (which ties to the “required” aspect below). Or if you want to get all geeky, consider the “could” to be Schrodinger’s cat in a state of NOT checking it versus Schrodinger’s cat AFTER you have checked on it. The issue is whether the claim is specific enough to make coincidental fulfillment of a condition insufficient to anticipate the claim. The claim considered by the CAFC specified that the arrangement was “based on a rule requiring the image elements to be contiguous”, and it’s reasonable to check the spec and determine that “rule” means an actual computational process, rather than some sort of “rule of thumb” contemplated by the claim drafter but not implemented in code. I’m sure this case will be cited over and over again by attorneys in applications where the examiner points to an edge case that the prior art is capable of. But that’s not what the CAFC was talking about here. This is pure ins @nity. When do we stop the farce? Perrodin’s algorithm could not guarantee contiguity. So … where is the recitation in Farcebook’s awesome claim of an algorithm that “guarantees” contiguity? Are rules eligible subject matter now? Are rules considered to be compositions, or are they articles of manufacture? “further applying a rule, where said rule guarantees that X happens”? What’s the different between that and a claim that reads “A new rule, wherein said rule is applied in the context of carrying out a method, and wherein said rule guarantees that X happens?” Answer: there is no difference. The CAFC is once again demonstrating it’s complete id i 0cy here. The only issues before the CAFC is anticipation of claim 1. I don’t see where eligibility is discussed. Do you mean that the CAFC should have addressed eligibility sua sponte? Without briefs from the parties? Do you mean that the CAFC should have addressed eligibility sua sponte? Without briefs from the parties? LOL You think this is complicated? You need briefing??? Please give us all a break. This is not a “limitation”. This is a desired result. The CAFC should just simply ignore it. “New results”, by the way, are not eligible subject matter. That’s one reason for ignoring them when they are recited in an otherwise unpatentable method claim. A “screwdriver” is a desired result. Anything that sounds in the action performed is a desired result. “Walking” is a desired result – as, being something in and of itself brings health benefits, the “result” of putting one step in front of another on a repeated basis is a result called walking.